Chelsea host Manchester United on Sunday in the knowledge they have beaten the champions more often in the Premier League era than any other side have beaten them. In 43 meetings that have won 14 times for a win rate of almost 33 per cent. They achieved all those 14 wins in an era when United were managed by the titanic figure of Alex Ferguson as opposed to the current manager, a boss in charge of transition, David Moyes. Only Liverpool and Arsenal aside from Chelsea have attained double figures of wins over Chelsea in the era, and neither of those teams – nor any other major club – have a better head-to-head record against United than Chelsea. Chelsea’s complete PL record against United reads: P43 W14 D16 L13 F56 A56 Pts58. In fact Chelsea are the only team of the Premier League era – among any clubs who might ever have been considered to be top-six contenders – to have a better overall Premier League record against United than United against them. Chelsea also have most draws against United: 16. So Chelsea’s 58 points against United is not quite matched by United’s 55 points from Chelsea. Chelsea’s 14 wins against United have been split between eight at Stamford Bridge and six at Old Trafford. United have lost 120 of their 831 Premier League games to date (or 14.44 per cent). Of those defeats 38 have been at Old Trafford (four already under Moyes) and 82 away from home. Swansea have been on a terrible recent run, taking just two points from their last six games, against Norwich, Everton, Chelsea, Aston Villa, Man City and Man Utd. 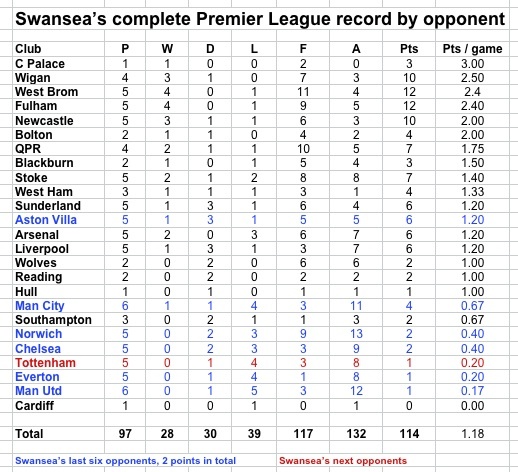 But as our table below shows, they had struggled previously against all this group, winning just two of 26 previous PL games combined against those clubs. 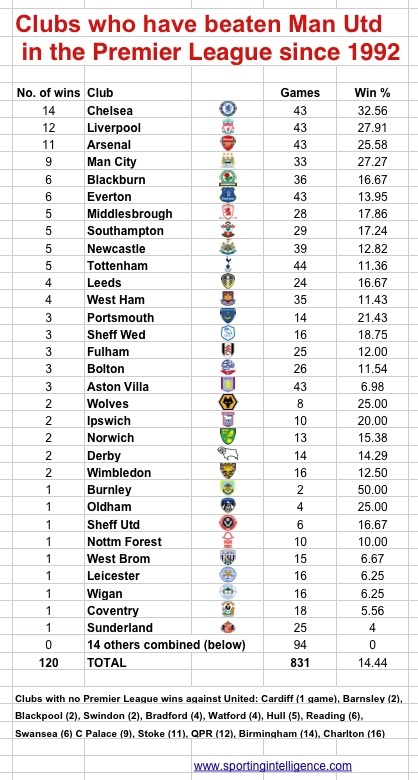 The table also shows their record against this weekend’s opponents, Tottenham, is poor. Still, relief is ahead, with Fulham on the horizon before the end of January!